If you are wondering why I haven’t been posting much…..you are not alone. I got a call from my Mom today asking what is up! It is not that I am running out of things to say or that I don’t love you guys anymore because, I love all my readers so much I would make out with each one of you….so that brings me to what has been keeping me busy. Well work mostly….but this is a good thing since I very happy and getting to do some pretty cool and different stuff. Well for one I am leaving in two weeks for a couple weeks on the road in an RV to spread the love of FreshBooks. I will be driving from Miami, FL to Austin, TX (with stops in West Palm Beach, Orlando, Jacksonville, Tallahassee, Pensacola, New Orleans, Baton Rouge, Houston, San Antonio and Finally Austin. Oh ya….I should clear up that I have been blogging…just not here so much…..I have however been posting a bunch of stuff over on the RoadBurn (RV trip) Microsite and want more then anything to post this video of an RV salesman curse for 4 straight minutes. It is only funny for a minute or two but I laughed the first few times I watched it. Two other cool work things I have been working on combine two of my greatest loves. Podcasts and Shoes! We are sponsoring a contest with Yahoo and PodCamp Toronto to take some folks to see a Hockey Game. If you are into Podcasting and are considering or are attending Podcamp Toronto you should check this contest out! 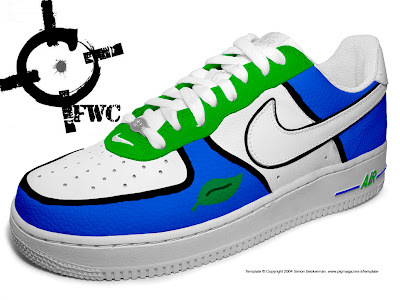 I am super Jazzed because I soon will be sporting custom FreshBooks Nike Air Force Ones! I will be premiering these kicks on the RoadTrip but you can see them first here! Thanks for indulging me in my gushing about work projects and I promise I have some original content coming tonight or tomorrow!